Soon after the Jefferson County Fair is the Kitsap County Fair. This one is much larger, and has a midway with all the carnie trappings. It's got the 4-H component for the kids, but it just seems a bit seamier. One thing to note - I never saw so many toy guns. 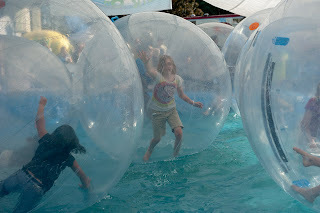 my favorite thing at this fair was the 'Walk on Water' ride: someone got creative and rented out bubbles you can walk around in!